Why choose an IST system? If your processes require to clean your surface treatment equipment with chemicals, to deburr with acidic solution, to strip or profile surfaces, an IST surface treatment equipment can make you save time and money. IST’s surface treatment systems, designed for non-stop blasting, will increase production rates since automated blasting is faster and more efficient than manual methods. An IST system enables you to perform multiple tasks, ranging from blending surface flaws to removing foreign matter, such as carbon from pistons, without affecting tolerances. Modular design, including many standard factory options, lets you select a system that’s just right for you without paying for features and accessories you don’t need. IST also gives you the choice of a suction or pressure blast system. By simply varying air pressure and blast media, you can clean or peen and do a lot more in between. Blasting eliminates the environmental hazards associated with chemical finishing because most modem blast media are non-caustic and non-toxic. Plus, IST systems put the emphasis on safety in mechanical ways with these features: blasting interlocks on cabinet doors, rounded comers on safety-glass viewing windows and guards on sharp floor edges, just to list a few. 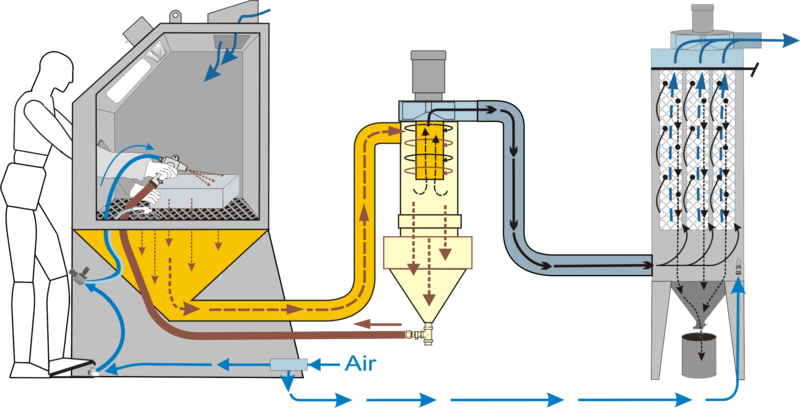 Sanblasting Cabinet: Pressure or Suction? For most applications, an economical suction type cabinet is all you need for maintenance and light duty jobs. Compressed air released by the operator’s pedal or gun trigger, rushes to the gun and creates a “vacuum” which in turn draws the abrasive and expels it on your work piece. Media is then returned to the reclaimer to be cleaned and dust is exhausted to the dust bag. This system operates with lightweight reclaimable abrasive such as glass beads or aluminum oxide. 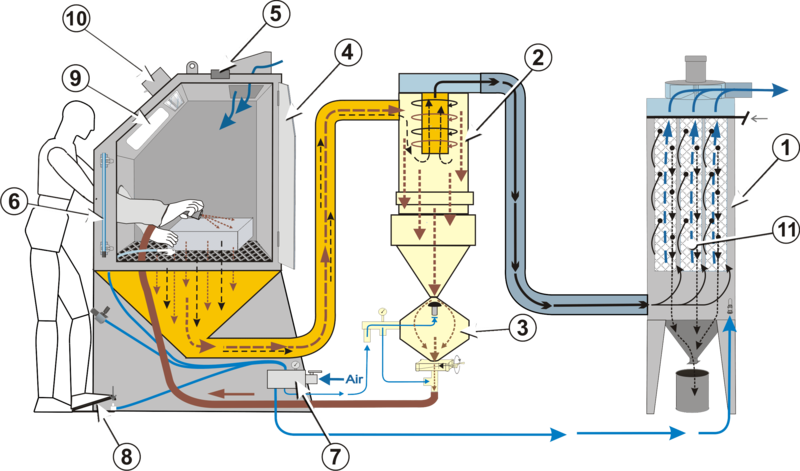 If the cabinet is used to operate on a medium production basis (averaging more than one hour per day) we recommended a high-performance dust collector to achieve the best results. Specially designed to increase productivity, the pressure type cabinet will give you fast results with tough jobs and hard-to-reach areas. Each IST pressure type cabinet 1.3 cubic foot pressure vessel that forces media through the blasting hose and the tungsten carbide nozzle. After impact on the work piece, the abrasive (glass beads, aluminum oxide or other light weight reclaimable media) is transferred to the reclaimer, which separates reusable media while dust is exhausted into the collector. High performance dust collectors are standard with all IST pressure type cabinets. Features an energy-saving air-filtration system that captures 99% of all particles one micron or larger. 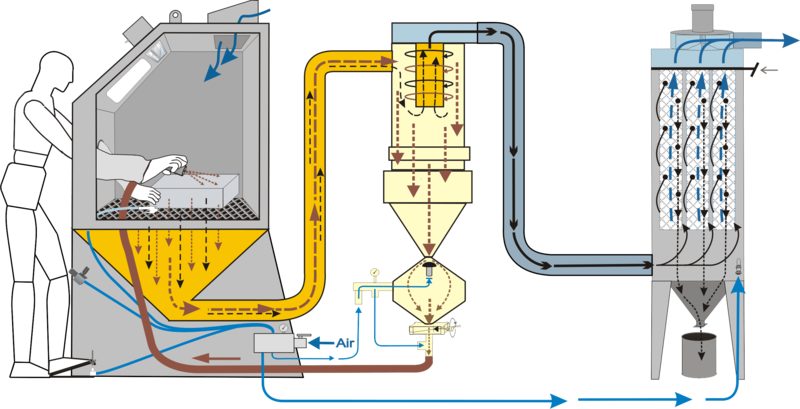 Fan is mounted on dust collector rather than reclaimer to prevent abrasive wear to the fan housing and impeller. Cartridge-type dust collectors, offering improved efficiency and durability are also available (available in 600, 900 and 1200 CFM models). Can be adjusted to control media size. Externally adjustable tuning band requires no tools and controls the size of media extracted from the blast media. Screen prevents oversized particles from causing clogging and an easy access door permits quick filling. One-point-three (1.3) cubic-foot pressure vessel minimizes refilling time and seals automatically for fast, easy startup. Construction is ASME approved. Rigid, dual-panel doors stand up to abrasives and seal more tightly than single-panel doors. Flush construction minimizes media spillage when the door is opened. Prevents accidental blasting when doors are open. Complies with OSHA (USA) requirements. Assures continued tight sealing as door gasket ages. Simple, pneumatic controls deliver greater reliability than electric controls employing limit switches and solenoids that often stick and burn. Wide foot treadle enables operation with either foot. Large safety glass window can be changed in a few seconds without tools. Equipped with standard interchangeable safety film to protect the original window. Recessed LED lighting compartment also creates an air stream across the viewing window to reduce dust buildup and improve visibility. Cartridge-type dust collectors available, offering improved efficiency and durability. Is the Solvent Recycler safe? Yes. There are many built-in safety devices with multiple redundancies. The system is CSA certified to meet the UL2208 explosion-proof certification as well as NFPA codes. Will product quality be maintained (i.e. will the distilled solvent meet or exceed original specifications)? As long as the recycler is operated correctly and according to provided instructions, the quality of the distilled solvent should meet or exceed original specifications, and come across with no contaminant-based color. We recommend that you speak to one of our specialists to review your operation and work with you to choose the best system as there are many variables to take into consideration. Why use a Vacuum-Assist system? The use of a vacuum-assist system lowers the atmospheric pressure in the cooking chamber and therefore reduces the boiling temperature of the liquid. We typically recommend vacuum assist for certain types of solvents where the boiling point and flammable limit are within certain parameters. Our specialists can identify if a vacuum-assist is needed in your operations. Are there any regulatory issues associated with the solvent recycler? No and Yes. Keep in mind that even though the storage of a hazardous waste is regulated; the recycling process is exempt from RCRA regulations; therefore, no permit is required for the solvent recyclers. You still need to treat the waste under RCRA requirements. There are fire codes that must be considered when installing any recycler. Our specialists can help you with that information. Are there any codes that must be followed with the solvent recyclers? No. A relatively untrained person can operate the recycler. An operator’s guide is provided with the unit. Very little is required for model SR30 & SR60….approx. 6-8″ and for model SR120 & SR180 18-24’’ behind the unit for clearance is required. What are the voltage requirements – voltage and full load amperage? No, not with our standard product. Some options, such as vacuum-assist or fluid transfer kits require compressed air. 2 Years Limited Warranty…..the longest in the Industry. The seal on the tank lid should be replaced at the annual tune-up along with the thermic oil. Waste is collected in a special Recycler Bag. It is easily removed, contact us today should you require more bags. ISTpure does offer various lease options. Please inquire if you are interested.